We strive to grow and sell the best quality orchid plants for all our customers, and to build a lasting reputation in the industry as one of the very best. 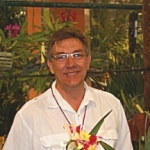 Florida SunCoast Orchids is led by Jim Roberts, a leader in the growing orchid industry of Florida, operating throughout the state of Florida as well as supporting national market demands. It was in the college days of 1979 when I first encountered orchids during a routine doctor's visit. While there, I noticed a large cattleya orchid on his desk. I asked the fateful question: “What kind of flower is that?” To which the physician laughingly replied, "You do NOT want to know!" A short story by the doctor about his all-consuming hobby ensued and within two days I had gotten two orchids of my own. During those college years in Northfield, Minnesota, I was put in charge of the St. Olaf greenhouse and its repository of orchids. I knew little about the plants but read everything I could get my hands on. After graduating, I moved to St. Croix in the U.S. Virgin Islands where I happened upon a sidewalk sale by the local orchid society. I joined the group, learned much about growing in a tropical arid environment, the native orchid species, and won my first AOS award for Encyclia bifida 'Loves Favor' AM/AOS. Leaving the island three years later, I found myself trying to take 10 boxes of plants through customs back to Minnesota. Little did I know that the customs encounter would be easiest part. It was a totally new experience trying to grow plants in a cold Midwestern state. Many plants did not survive. Many did, and I learned that orchids actually could be grown quite successfully in the stifling environment of a house surrounded by ice and snow. During those return years in Minnesota, I worked in the horticulture industry, served in various capacities with orchid organizations and lectured to many garden clubs. I also had the privilege of traveling extensively around the United States, Europe and Hawaii for my career, visiting all of the major orchid nurseries. It was during this time that I started to turn my avid hobby into a small business. In 2001 we moved to Florida with a small collection of plants and the dream of operating an orchid nursery became a reality. We currently grow our beauties in three gutter connected greenhouses encompassing 10,000 square feet of growing space. As always, I strive to grow and sell the best quality orchid plants for all our customers, and to build a lasting reputation in the industry as one of the very best. My deepest thanks to my wife Mary, my kids, and all those who patronize our business. My deepest thanks to my wife Mary, my kids, and all those who patronize our business.